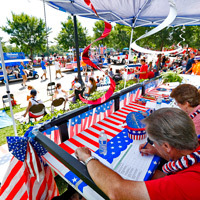 Webster University's float in the annual Webster Groves Community Days July 4 parade received the "Outstanding" award in the category of Best Theme. Global Marketing and Communications, Community Engagement and Facilities Operations collaborated on the University's representation in this major community event, including constructing a float and organizing staff, alumni, student and family member volunteers to represent Webster during the parade, which drew an estimated 40,000 spectators. Beginning July 10, the south ramp entrance to Loretto Hall stair tower will be closed for re-grouting and sealing of the exterior and interior glass blocks on each floor. The trim will be painted also. During this time the Loretto Hall elevator will only be available from inside the building by floor. Upcoming maintenance and upgrades on the Webster Groves campus include work on Lot J, the Colonnade crossover and new transformer installation affecting several buildings.